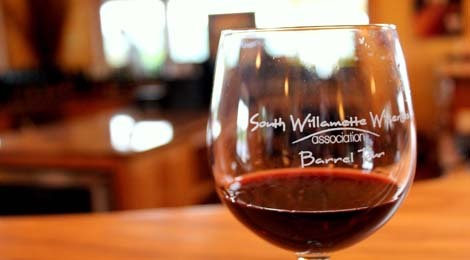 The weather is never a sure thing in the South Willamette wine country, but the wine always is. With soggy fog hanging over the valley, for the start of the Saturday, June 18 Barrel Tour, I worried people would be damper from the drear. But while the weather threatened to rain, nothing threatened to ruin the spirits of the attendees. Arriving at the Valley River Center parking lot at 9:30 a.m. in floods, the tour guest vanquished puffy eyes with venti Starbucks coffee and the true weather warriors paired shorts and sandals with swishy rain-jackets and excited smiles. Splitting the group between four buses, each bound for different wine rotations, we were ready to roll.From couples of all ages to girlfriend get-togethers and one grandmother and grandson duo, my bus was drunk with excitement even before the first taste. Dressed in a black, pinstriped shirt and barely able to stand up fully in the bus – later in the day standing became a little more challenging for other reasons – our tall, young tour guide, Derrick from King Estate, set the tone for the day as the bus weaved out of town. Further pumping up the group’s energy before the first stop, Derrick jokingly tested the group’s wine knowledge with trivia. While still early Sweet Cheeks started the day off strong, introducing our group to the elegant and lightly sweet Riesling paired with Riesling macerated strawberries and the winery’s robust, minerally Reserve Pinot Gris with crème frâiche stuffed potatoes topped with caviar. Surrounded by the stainless steel vats in their production room, the Australian winemaker, Mark Nicholl, personally welcomed the group. After enjoying the whites, I wandered through the small, dark barrel room, where Nicholl with his stylish sideburns and beautiful accent served up a delicious, earthy 2009 Syrah from the barrel paired with house smoked pork sliders. With an hour to taste and enjoy the food, the informal setting allowed guests to sample, relax and chat with the winemaker who shared with willing listeners his passion and knowledge of the vineyards. The barrel tasting of the Syrah exemplified the health of his vines and quality of his craft because before the bus pulled away a list of pre-orders waited for the unbottled wine. Between kind bickering of couples and the occasional bad joke by the tour guide, we made our way to the second stop of the day. Nestled in a cozy corner of the valley, especially with the fog hovering in the air, Sarver Winery received the buses at its small tasting room surrounded by hillsides of green vines. With French folk music playing in the background, the three wine samples danced their way across the palate. The 2009 Estate Pinot Gris offered notes of crisp pear and apple and paired deliciously with a spiral-wrapped pancetta asparagus. The intimate tasting room then settled in with a tasting of the 2010 Estate Pinot Noir Rosé, which had a subtle sweetness reminiscent of Guava. If you close your eyes and smell this wine, you can almost feel the sun come out, it’s so tropical. The Rosé was served with a Phyllo Gruyère Cup. The final tasting, a peppery Pinot Noir made in a burgundy style, showed layers of cherry with a nice drinkable medium body. Plated with an equally irresistible chocolate pot de crème, the wine shined with the traditional delicate qualities of the varietal that makes it famous in Oregon. Even with the cold weather, the wine quickly warmed up the visitors. I was even adopted by a kind couple from Eugene and their friends visiting from Klamath who noticed I was wandering around stag. With the ring of a big, brass bell hanging outside of the tasting room, the owners, Chris and Erin Sarver wished us farewell. Without a formal tasting room for visitors, Capitello Winery poured at their neighbor’s place – good thing that neighbor is another award-winning winery with lots of space, Domaine Meriweather. As the bus filtered into the room, our glasses filled with Capitello’s 2010 Walnut Ridge Sauvignon Blanc, a crisp white aromatic wine paired with an Asian spring roll. With the encouragement of two wineries behind us, the room said hello to our second winemaker from down under, Ray Walsh, with a group sheepish “baaa” as instructed by the Sweet Cheeks winemaker. The New Zealand background also influenced Walsh with two lines of wine, one grown in each region. herb garnish followed by the day’s only dessert wine, a 2009 Dolcino Oregon Gewurztraminer plated with assorted cheese that balanced the sweetness of the wine. with couples before our bus set off for the fourth and final winery of the day. While a handful of the party bus may have been past their peak by the fourth winery – the quality of the wine never decreased. From their 138 acres of estate grown grapes to screw cap selection, Benton-Lane Winery signed, sealed and stamped with excellence. Way more than hope could be tasted in their Pinot Noir, which makes up 80 percent of the vineyards’ total varietal production each year. The wine featured an aromatic expression of fruit with complex layers and notes of deep cherry. Benton-Lane’s small batch of Pinot Gris also stood out with soft flavors of citrus. To the hungry wine connoisseurs, Benton-Lane paired their wines with gourmet vegetarian bruschetta,alder smoked salmon with sauce, and vegetarian pizza cooked in their outdoor patio oven. And the Barrel Tour definitely helped things work out for all the wineries. As the bus drove back to Eugene, in its under-belly swished the boxes and more boxes of purchased bottles – just as fully a-glow with wonderful wine as the passengers above.